Cities: Skylines - complete guide with tips on infrastructure, public buildings, roads and more. In our solution to Cities: Skylines we provide you with helpful tips for new simulation cities. Our complete guide to Cities: Skylines offers you entry-level about the different worlds, infrastructure, roads and their reconstruction, increasing the population, public institutions and neighborhoods. Before you begin to build a city, you are allowed to search for a region. There you can build your dream city. Therefore, you should consider your selection. The various areas differ in several characteristics. For now, it should be noted that the regions are differentiated visually from each other. Some look like as if they were in a cooler part of the Europe, covered with a light mist, while other regions are sunny and boast beaches. But apart from the optic time, which actually has no effect on the game, there are other criteria to be considered. In the menu you have to look at the possibility of the distribution of natural resources. This is different for each region. While encountering in more oil resources, there are other more ore, agricultural and forest resources. You should also note the abundance of water - the higher the indicator is, the less land is available. It also shows how well the construction areas are. You should also note that outgoing transport links are available. Give you an overview of all the features of the regions. The minerals and resources are important for the growth and the economy of your city. Incidentally, your area at the beginning of one of the many parts of the region. 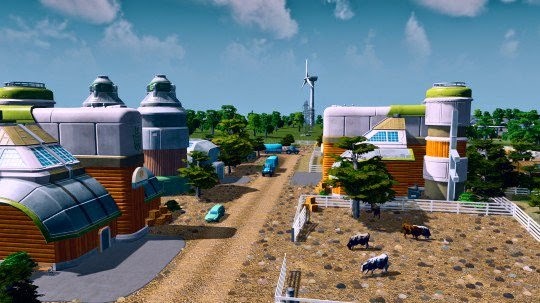 Here you get the option to buy more land in your environment to help you enhance your town. To build a well-functioning and great city is not easy and requires skill and strategic action. A perfect solution does not exist here. In any action to follow a new situation, new problems and new opportunities. Around the city but for the future residents as possible satisfactorily to build, you need a good start for your new city. Every city you should start with a well-functioning infrastructure. A few streets down to fit needed to the building areas are defined. You should not build too many roads at the beginning. Consider the following development points: don’t build the industrial area too close to the residential area. Your residents will then most likely sick and unhappy in the long run. And try to build a healthy balance between residential, commercial, office and industrial area. If there are more industrial than residential areas, the risk is high that there workers are missing. To feed your new residents with water, sewage and electricity, you should buy water and power plants. Place them as far away from these residential areas. Because it is possible that the power plants pollute the environment and also cause noise. In addition, the residents need city schools, fire stations, health centers and police stations. Back to the top it is sufficient to take the smallest variations. Large police stations and fire stations are needed only in major cities. Buy only what you really need! You will quickly realize that you need a landfill. Place them as far away from the residential area - after all, landfills pollute the environment. But it is important that it has a good road links. If your city gets new residents, you should soon be making money on tax revenue. This can regulate how you like it. However, you should not possess too much tax - otherwise it could happen that the residents of your city may flee. The balance between expenditure and revenue determines your success or failure. Besides the usual areas such as residential, industrial, and commercial offices, you have the possibility to build public facilities. Thus, police stations, fire stations, schools and hospitals. You should buy at the beginning only the smallest versions of these facilities. Larger police stations, fire stations, hospitals or universities established its best if your city is already grown quite a bit. Because these institutions have a longer range than the small variations. In addition, these facilities bring ongoing costs, which can be covered only when you shall possess too many taxes. If your city is even greater need its cemeteries. Send cemeteries hearses to pick up the dead in homes of residents. Note that cemeteries are filled. And then they must - as strange as it sounds - to be emptied. To do this you have to give the instruction by clicking on the cemetery on the "emptying" icon info field. The industrial area is particularly vulnerable to fire. Therefore consider that there you should build more fire stations, as in other building areas. If you see more buildings burn down, and could not be rescued by the fire department, which is a sign that you need more fire stations. In addition, there are special buildings that are acquired in the course of the game. This you can build unique. These are, for example, operas, stadiums or aquariums. These should not build directly in a residential area. Residents are happy although initially on the new leisure facilities, but the noise brings new excitement. A good road access is extremely important. Because that you are laying the foundation for a well-organized city. Roads linking the city residents with their work and public buildings. So you should build many and wide streets. Of course you have not enough money in the beginning, nor the possibility to build wide streets - because they are naturally more expensive than the narrow streets and also not been activated yet. In addition, the wide streets at the beginning are not necessarily important because they do not exist mostly as many inhabitants. But you should not be tight build one another, but always leave space between the building sites. So you have the opportunity to expand the streets later on. This is very simple, in which one chooses a wide street in the menu and then click on an existing road. This is when space is available, transformed into the selected road menu. But when you should rebuild the roads? How do we know from when the roads are too narrow? Residents of your city will quickly indicate problems. This begins with the garbage disposal does not reach the houses. Then you make the city people about the in-game social network "Chirper 'attention. Furthermore, the residents may complain that no one picks up the dead who are with them at home. With elevated roads can meet its traffic problems. This you can build in which you chooses a road in the menu and determine the height of the image with high key and PageDown key. In addition, you can reduce road congestion with public transportation. However, it is important that you have just met the milestones. With the milestones subway, trains, ships and planes are unlocked. With the start of a new game, you should first of all stop the basic needs of your new or aspiring urban residents. This means you need especially electricity, water and sewage. To generate electricity, you should build a power plant. In this case, you have to start the choice between wind turbines and coal fired power plants. Both plants have their advantages and disadvantages. A wind turbine of course, does not produce as much electricity as a coal power plant. But it does not pollute the environment. A wind turbine should also be directed to a place where it is very windy. Because of course more wind means more energy. Where is such a place, you can quickly find out with the filter function. But beware: do not build too close to residential areas. Because wind turbines make noise that could disturb the residents. A coal power plant has the advantage that it produces a lot of energy, no matter where it is. However, a coal power plant pollutes the environment and should therefore not close to a residential area. Later, other power plants can be unlocked - for example, solar power plants and improved wind turbines, which generate more energy. What needs to be considered when water? At the beginning of a city, you have to take care of you, not just the current but also to water and sanitation. The water source you can place a water tower or pump from a lake or river water and let it get cleaned your city dwellers. After you have placed a water pump or a water tower, you should move water pipes and so supply the building with water. Also, you can separate a sewage pipe on the river or lake place. The pip should be placed so that the water flows upstream. But mind: Even if you install the waste water ear as recommended, the river is being polluted by it. Therefore, avoid water pumps for drinking in the vicinity of sewage pipes. Otherwise you risk contamination. If you have enabled the later treatment plants, you can replace the sewer pipes to the waste water treatment plant to avoid major pollution. The waste water you can connect to the network of water pipes. If you have created construction sites, you can divide them into different neighborhoods. This simply goes with the appropriate tool - simply painted on the areas to be included in the district. Neighborhood offers you the possibility laws to regulate and tax plans differently. How you can district with the directives high-tech buildings and create fire alarms. You can also build other neighborhoods where residential areas are cheaper and the residents get electricity meter in order to save power. The guidelines of the district are independent. Particularly interesting is the division of industrial areas. This you can divide in agricultural, oil and Ore zones. So the country's resources can be used. How to reach more residents? If you come to a point where the number of residents is no longer rising, you have some options. For one, it could be that your city is not simply more attractive. This can have many causes: Too few hospitals, police stations or schools. Maybe you should also build a few parks or other recreational facilities to make the inhabitants of the town tasty. You might also need wider roads - that could solve some problems quickly. Maybe find your inhabitants no more jobs and are unemployed? Then you should invest in new offices and industrial areas. Thus, many residents find new work. If this does not help, you might need more education. Build more schools, including high schools and universities. Another possibility is that the city is not adequately supplied with electricity, water and sewage. If this is the case, leave the city residents. The filters you can find out whether the city people may be missing something. If there are enough free residential areas available that can be built? In a large city you could quickly lose the overview and forget such things.